I’m spending the holidays in Northern Wisconsin this year, where I’m embarking on a little health and writing retreat. The 12 inches of snow and subzero temps are not what I’m used to, but I’m enjoying every single minute of this restful time. 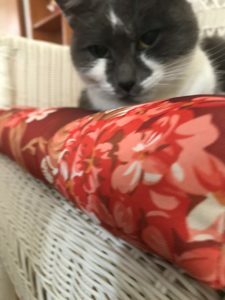 Despite her affinity for polishing off innocent creatures, Patches clearly adores warm, safe cabins, comfy couches, and human connection. I can’t blame her. I love all those things, too. Maybe it sounds a little silly, but what if we could revel in the gift of Christmas the way Patches revels in the gifts of warmth and cuddling? Purring with sheer delight. With reverence and awe. Surrendering ourselves to the season with complete abandon. 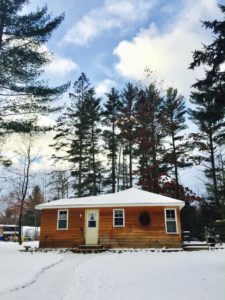 Here in my quiet cabin, I have the time and space to reflect on what’s so beautiful and important about Christmas, and why that truth often gets buried in the “crazy” of the season. I have so many gifts to revel in: my wonderful friends who pour into me 365 days a year. My generous and gracious family. My hope-filled present and future. My freedom from darkness, fear, and shame. And most of all, the God who chose to give me (and you) these gifts by coming here to earth Himself, being born in a cold stable instead of a warm cabin, and willingly receiving our darkness and death so we would never be left hopeless. I want to receive these gifts with complete joy and amazement.! But somehow, accepting these gifts is always the challenge, isn’t it? Even miles away from my hectic life, I manage to get caught up in the Christmas crazy. (I’m still shopping for my last gifts from Amazon and trying to wrap up a couple work projects. Yikes!) My brain is occupied with everything but this beautiful season. And then I remember Patches, and how much she adores the gifts she’s given. If she could talk, I’m pretty sure she’d tell me something like, “Psst, yo, Ginny, let’s enjoy this moment! It’s Christmas! And the best gifts are ours…Purrrrrr….” Yes, Patches! You’re right! (I’m not sure if cats say “yo,” but I think Patches might.) I never would have guessed a cat could give me a new perspective on Christmas, but that’s what happened. What little reminders move your heart to celebrate the true meaning of Christmas? Here are a couple of songs to inspire your Christmas spirit!